Making a POD with Lightning Source: Holy crap…I got me a book! The process of creating a POD version of Freedom Club continues to progress well. After uploading my content PDFs for both the book’s interior and cover, I finally received my proof copy by UPS. It’s a perfect bound 5×8 trade paperback, perfectly square with soft cream paper. Just over 400 pages, it feels like a quality product. Lightning Source has done an outstanding job, and it sure does feel like I made the right choice using them for POD distribution. I must say, seeing the book on real paper does give one a true sense of accomplishment. Now all I have to do is market the book, and get everyone to read the darn thing. That…will probably end of being a life long endeavor. I am of course indebted to everyone at Hotspur Publishing who helped bring this to fruition. I’m certain my first book would have been a disaster if I’d gone it alone. Stay tuned for more on my humble attempts at marketing. 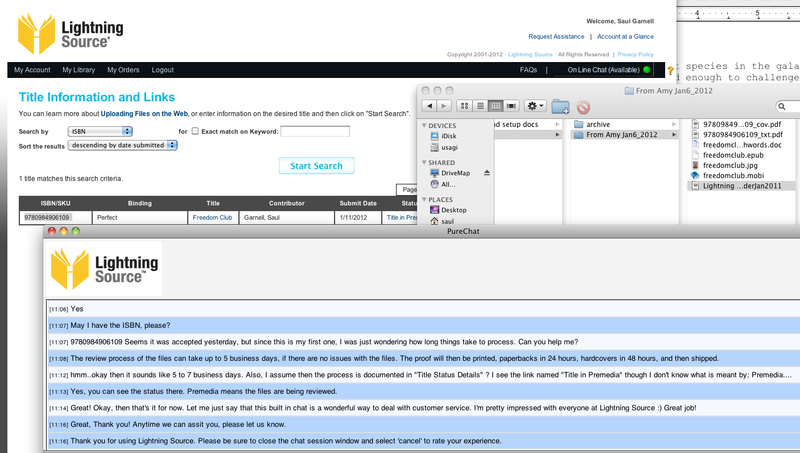 One thing I’d like to highlight is the Lightning Source customer website. It shows all the titles that have been submitted, and contains an instant link to on-line chat with their customer support team. Below is a screen capture of my chat with them. They were nice about confirming the status of my new submission and the next steps of the process. I must say, it was wonderful having their on-line chat– right there on the spot. All my questions were answered, taking a lot of worry out of the process. Customer service website with full overview and on-line Chat. Very nice! Another point worth mentioning is the fact that Lightning Source is having a campaign, allowing me to set up new titles for free. Normally, it costs $75 to set up each book, but this fee is dropped if I order 50 copies. Since I needed promotional copies anyway, this was great timing! So far, so good. I’ll keep writing as this process continues. 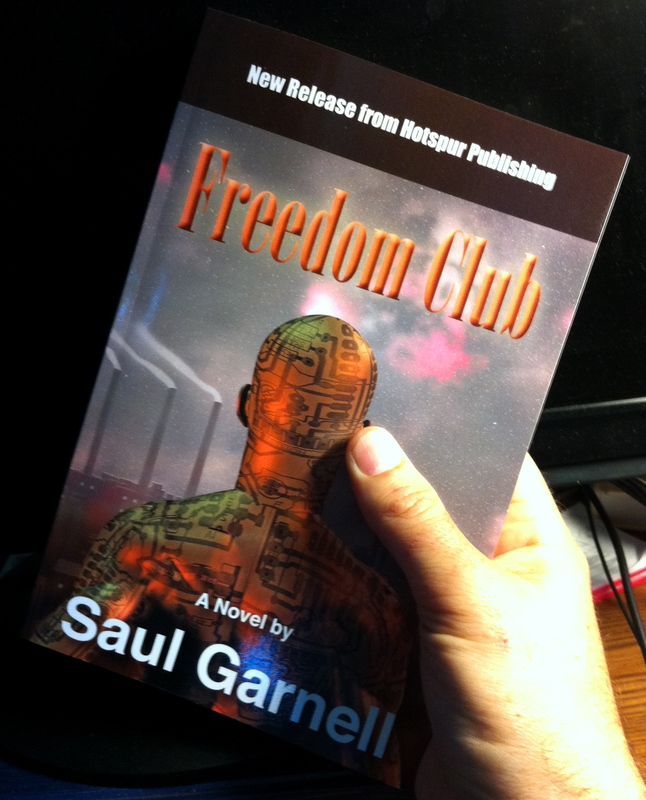 To complement my Amazon version of Freedom Club, I’ve created a Smashwords version that is now on sale. The main reason I’ve done this to increase the number of channels my book can be sold through. Namely, I want Freedom Club to be sold not only on Smashwords, but also through Apple’s iBooks and Barns and Noble dot com. There are more channels available, but from my point of view, these three are the big ones I wish to cover at minimum. Like Amazon, Smashwords makes the “basic” process simple. You make an account, fill out a few fields of metadata, and then upload your book and cover via a Microsoft DOC file. What could be easier? Well, the process is deceptively complex, primarily because Smashwords claims to require “minimal formatting” requirements to make the book available via all participating channels. Now you may ask what that means? It means that the converted file formats (converted by Smashwords themselves) must pass their internal testing engine called EpubCheck. I’m not going to explain what technical magic it takes to pass this test. If you want to know about that, just search the interenet. There, you’ll find boatloads of people pulling the hair out of their heads trying to figure out why errors occur, even when they follow the Smashwords guidelines precisely. To make a long story short, I simply used Amy Gilbert Design to format my book for me. Amy is (as far as I’m concerned) a goddess of ePub formatting and has figured out not only how to pass the dreaded EpubCheck-a-monster, but makes the books look very good after Smashwords conversion is finished. This is no small feat, I assure you. Having avoided most formatting issues, the more positive side of Smashwords was available to me. They have a fairly reasonable royalty sharing scheme, the breakdown of which can be seen in the image I included above. 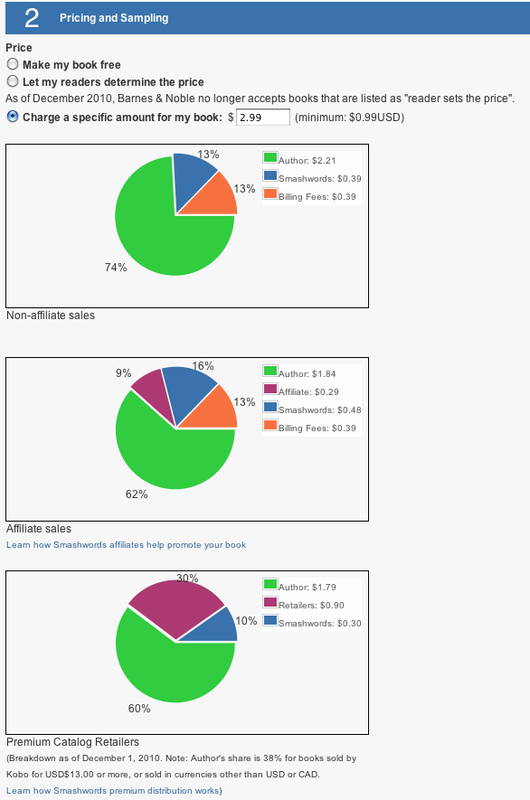 There may be those who feel the amount paid is not worth it, but as an aggregator (a company which collects royalties from other channels and pays you one check) I think Smashwords’ royalty scheme is acceptable. In the end, they save me from having to upload my book to various channels, and monitor everything on my own. For this service, I’m happy to pay. In the end, Smashwords seems like a good choice. However, I will hold back my final recommendation until I gather more experience with them. It’s not like I expect bad things to happen. But I live by the credo: hope for the best, but expect the worst. Will keep you all posted. I’ve begun the process of creating a POD version of Freedom Club. There are several choices on the market: LuLu, CreateSpace, LightningSource, and scores of others. However, based on the information I heard from other authors/indie publishers, it seems the best reviews I received were about Lightning Source. Thus I begin this process with them. My publisher, Hotspur Publishing, is also looking into other sources for POD. CreateSpace is for sure a strong runner up. However, the quality of the books printed by Lightning Source are really something to behold. If it comes down to just printing quality, their output is perfectly square, printed on the finest bond paper, and are thinner than their competitors. I’m told the ability to create fairly thin books is due the superior quality of their POD press. At least, that’s what I heard from other Indie publishers in Australia. The only comment I can make so far based on experience is the difficulty I’ve had setting up an account with Lightning Source. It started with an online submission, followed by an email that required I reply to it (same questions asked as on-line version), followed by another round of on-line questions, followed by PDF contacts and W-9 forms, followed by me signing it all and faxing them back. All done: yay! The cumbersome process for initiating my account was annoying . However, in retrospect I’m thinking its how they avoid the flood of I-have-no-idea-what-I’m-doing self publishers out there. Another negative is the up-front set up fees required by Lightning Source. However, these amounts are not huge. Freedom Club will cost a little over $100 in total to set up (including the ISBN I had to buy), so it’s not an amount I would complain about. With the account setup and ISBN in place, now all I have to do is get my content in order. For that I’m once again relying on Amy Gilbert Design. She worked wonders on my eBook versions, and I looking forward to the final design and layout she provides for my POD.